Ask any adventure virtuoso, backpacker or avid traveler to list some of their most exciting adventures and odds are that you’ll have more than a few of them whose trips will have had stops in Thailand. From the vibrant streets of Bangkok, to the cultural riches of Chiang Mai and the natural beauty that engulfs Thailand’s national parks and beaches, Thailand is a dream destination for anyone looking to get off the beaten path. But before you charge your trusty camera or dust off that backpack that’s been hiding in your closet, here are five tips to follow to make sure that your experience in Thailand is one for the ages. Over-packing for a trip is never a good thing, but that especially holds true when visiting Thailand. Odds are that when you’re visiting Thailand you’re going to be very HOT. You’re not bundling up for an Arctic adventure and with laundry services available on the cheap, the last thing you want to do is carry a heavy backpack in the sweltering heat. Plus, you want to save room in that backpack for all of the clothes you’ll be buying in Bangkok and trust me, you’ll be buying a lot. It doesn’t matter whether you’re visiting the Chatuchak or Khao San markets, or stopping by the Suan Lum Bazaar in the evening, because you will definitely end up haggling your way to a new wardrobe. Bringing a set of toiletries is a must no matter where you go, but you’ll find that adding a few extra things to go along with your shampoo and toothbrush will make your trip to Thailand that much more enjoyable. To start off, make sure you bring a lot of napkins/tissues and some hand sanitizer to boot. And when I say a lot, I mean A LOT! You’ll find that not only do most restaurants in Thailand not have napkins at their disposal; neither do any of the toilets/stalls you’ll be using. While food in Thailand is absolutely delicious, your stomach may not always agree. That’s why packing some multivitamins and anti-diarrhea tablets is always a good idea. Finally don’t forget to bring insect repellent. If you don’t, you might become every mosquito’s new favourite dish. No matter how hard you try to fight it, the heat in Thailand will beat you. But before you try and find a local fountain to quench your thirst, remember that water in Thailand is not the as safe as the water back home. Do yourself a favour and make sure you always buy a bottle of water instead. It may cost you a little more but it will be worth it. Of course the street food in Thailand (and Bangkok especially) is another story. In fact your best meals are likely to come from your local street vendor so make sure to stop by or you’ll end up having missed out on some of the best meals you’ll ever have. Every place you visit will have a different set of customs and this is especially true when visiting Thailand. Before you leave, make sure to check up on some of the most important Thai customs as the last thing you want to do is to offend the locals! Making sure you smile, not pointing at anyone’s feet and dressing appropriately may seem inconsequential but winning over the locals is sure to bring you some inside knowledge to make your trip that much more memorable. And whatever you do, please remember to NEVER mock the Royal Family! Finally, when traveling to Thailand, it’s important to always come prepared. If you’re planning on figuring things out when you arrive in Bangkok then you’re going to be in for a rude awakening. Make sure you’ve purchased maps of your destinations beforehand, made a photocopy of your passport and figured out a general template of what you want to do beforehand. Thailand can be very fast-paced and exciting, but if you’re not prepared you can easily get left behind. Now that you know what you need to do to conquer Thailand, you’re one step closer to having the experience of a lifetime! 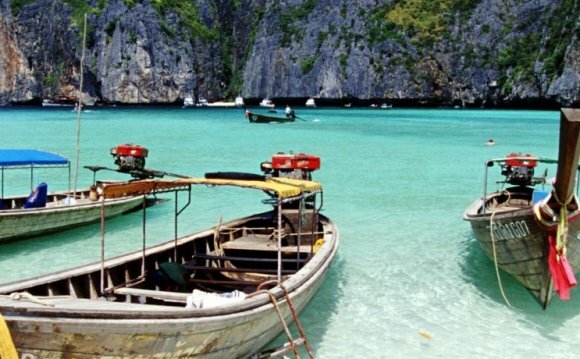 Thailand is one of the most exhilarating and thrilling places in the world and whether you’re there for a week, a month or a year, Thailand will be an experience that will last a lifetime. The Backstreet Boys' Never Gone Tour was a 2005 concert tour which featured eight songs from their fifth studio album, Never Gone, and all of the songs from their 2001 greatest hits release, The Hits: Chapter One.